A surprisingly large number of beetles can be identified by simply comparing a specimen with a colour picture eg. a male Lucanus could never be confused with anything else. Many cerambycids, chrysomelids and a whole host of other species are distintive enough to match a picture so closely that we may be confident of an identification. If we are comparing a specimen with a good photograph then so much the better, and if the photograph were coupled with some guidance then the potential of the method will increase. But with around four thousand British species to deal with the procedure can be prohibitively protracted and frustrating and, in any case, it is almost certainly not possible to obtain nice colour pictures of the entire British beetle fauna; firstly because such material very probably does not yet exist and secondly the list is volatile. But, for the purpose of identifying our fauna such a collection of pictures is not a sensible nor even a viable way to proceed; trying to identify Melandrya caraboides by trawling through pictures of every carabid and staph and palpicorn etc., etc. would soon induce boredom even though, in this case, once the correct picture was found a confident identification would be made. But this is Melandrya. Take another case, Cis nitidus. Working through pictures might place this in the Ciidae, it might also be placed in the Scolytidae or Bostrychidae or Anobiidae depending on the quality of the pictures and the equipment used to examine the specimen and the diligence of the worker. On the other hand a Hydroporus will soon be recognised as such and then, without extensive experience and with any but the most distinctive species, it will be misidentified. Part of the problem with comparing specimens with pictures is being unaware of what other species might closely resemble the one under investigation, and there are many closely similar species; many colour guides feature Amara aenea DeG. and, while the picture might be a very accurate representation of the species, it will also be a close representation of a few other Amara species to all but the specialist. To sort through the huge list of British beetles it is obvious that some way of eliminating groups of species would be an advantage and the larger these groups are the better. Such groups may be inclusive or, more commonly, exclusive. Understanding the lamellate antennal structure of Scarabaeoidea is advantageous as it narrows down a search either way, either the specimen is Scarabaeoid or this group can be ignored. Fortunately several large groups are very distinctive eg., Caraboidea, Chrysomeloidea and Curculionoidea and can be treated in this way. As you work through a few specimens the features of these larger groups become obvious and many can be placed quite quickly. Such features are generally combined into keys so that they can be worked through in a sensible way, the resulting groups are then keyed further until genera and finally species are determined. Many keys are a synthesis of the relevent morphological features used to identify a series of species and they can work well, they can also work with varying degrees of success and they can also be a complete failure. Worse still they may completely misguide the user. A large part of the advice we can give concerns keys but before discussing these we need to explore the notion of expertise because if keys were to work adequately and if they could be obtained easily there would be no need to specialise beyond the ability to be competent in the use of keys. Beyond the following discussion there are a few very important aspects of identification that the coleopterist needs to be aware of, aspects that are in many ways more important than the ability to use keys, because if the results of our identifying are to be useful they need to conform with the latest accepted nomenclature in order to be understood by others. But first, expertise. The difference between a cat and a dog must be obvious because in every case we can competently identify which is which. Now try to write a key couplet that covers all cases and things become very difficult, we might try to explore the notion of retractable claws or dentition but when we need to identify both dead specimens as well as living and very dynamic ones the situation becomes very difficult as well as frustrating because in every case we know intuitively which species our specimen belongs to. All dogs belong to a single species as do all domestic cats and so it might be imagined that a character can be found which will work quickly and simply in all cases. The way we actually identify them is by applying our experience of the group to the case in hand and with cats and dogs this represents an almost universal 'expertise'. Now a quote from Garth Foster and Rob Angus, two widely acknowledged and much respected experts in the field of aquatic coleoptera, writing on the genus Hydroporus in the Balfour-Browne club newsletter of march 1985, 'The real trouble is that one has to avoid the use of characters based on body shape, even though minute differences are eventually detectable to the human eye such that all species can be identified in the field.' and further on, 'Trying to define some useful characters often results in seemingly ludicrous measurements- an angle of less than 130 degrees or greater than 140 degrees, a ratio of less than 2.1 or more than 2.2.' Here we see on the one hand an acknowledgement that the various species can, with experience, be identified as one might a cat or a dog, and on the other hand an acceptance that the subtleties involved present formidable problems when it comes to depicting these in a practical and easily understood way. Looking at the outline figures of beetles in this paper (or see eg. Nilsson & Holmen or Joy) one might easily imagine that comparing a specimen to these figures will give a straightforward identification but such imaginings must be confined to line drawings; when we compare a real specimen to these the problems begin. Such is the nature of expertise and it can be very difficult for the inexperienced to appreciate the subtleties of this kind of thing. To take another example, here from Coombs and Woodroffe's 1954 key to Cryptophagus species, 'It is important to realise that, in this genus, some of the best features for use in a key are only apparently, and not measurably, different in the various species. Careful comparison with the figures is therefore as important as careful use of the key. The word 'apparently' or 'appearing' have been used throughout the key to designate such features.' And a last quote comes again from Foster and Angus 'No key can function properly with recently emerged specimens.' and later on, 'The safest way to identify teneral material is by careful comparison of structural features with identified mature specimens.' These examples have been quoted in order to give a feeling for the kinds of difficulties encountered when trying to construct keys to groups of sometimes very similar species, the compiler may well understand what these differences are and in practice apply them when identifying specimens, but to translate them into definite and workable couplets is another matter altogether. They may also serve to reassure the beginner that with plenty of consideration and practice even very difficult groups can become familiar. But we are not suggesting that it is as simple a matter as having lots of practice, this helps and is generally essential, but the words 'experience' and 'expertise' go far beyond some kind of advanced familiarity. In order to achieve this level of understanding a wider awareness of the subject matter is necessary; beetles do not come along in isolation but are the product of development and evolution and each exists within its accepted phyllogenetic place in the order of things and an understanding of such things will greatly modify the way we view the relationships, morphological and in many other senses, between species. From the point of view of using keys it is important to be aware that this kind of expertise will almost always develope in coleopterists devoted to their subject be it a single species or genus or whatever kind of group. For the beginner it can be infuriating having a specimen instantly determined by an expert after having spent many hours with keys and arriving at a name that proves to be wrong. The kind of expertise discussed above is an extension of our natural ability to see ever more subtle differences with experience and, as more and more experience is gained, these subtle differences become very obvious until the merest glance at a specimen may be enough to identify it. It must also be said that the aquisition of such expertise requires the necessary dedication and, of course, talent ie. intelligence when it comes to this sort of thing. If an 'expert' has constructed the key they they may find subtle characters to be more obvious than they actually are, and so when used by those less familiar with the group these characters may seem ambiguous. If line drawings are provided the user may need to manipulate a specimen in order to find an orientation similar to that used by the compiler. This may not be immediately obvious to the beginner. The character being studied may exhibit variation which is not made obvious in the key. Inappropriate lighting may mask or distort characters. When describing such things as microsculpture or very fine pubescence these may be overlooked by the beginner if an appropriate magnification is not given, similarly some idea of the best way to illuminate a specimen is often useful. At their best line drawings can be very useful and there are many examples of this in the literature, modern line drawings are almost always very good but looking through Joy's book of line drawings it should be obvious that they are of varying usefulness, most annoyingly in the staph section where the drawings are in a general way proportional to the size of the species so that with small species where one needs most guidance the they tend to give very little. Ambiguities soon creep in. Sometimes the language used to describe features can be inadequate eg.puncturation can be described in all sorts of ways and the distinction is not always obvious: diffuse, dense, coarse, fine, sparse, rugosely or confusedly among others. Colouration is still described in terms of ferrugineous, pitchy, testaceous or cyaneous etc., terms that you need to get a feel for because even if they fall into disuse the vast majority of the literature is full of them. It is sometimes baffling why a character is described as testaceous when in reality it may vary between specimens from orange to yellow or red. If something is orange then surely it is sensible to describe it as so! 17/22 Thorax non-metallic, usually darker than elytra, but sometimes concolorous, and occasionally pitchy. 22/17 Thorax with metallic reflection. Here you will soon learn that the 'metallic reflection' referred to is very different to the kind of metallic appearance seen in the carabids. In Joy's keys the terms elongate, quadrate and transverse are sometimes used optimistically; if you are viewing eg. a pronotum it may appear quadrate or whatever, and here you must be aware that 'long' structures may appear foreshortened under the microscope, but after getting nowhere in the key and you begin to work back and check things and in the process you actually measure the apparently quadrate pronotum it may well be elongate, your eyes can play tricks when it comes to appreciating proportions. I very much think that Joy's eyes suffered similarly. This problem of appreciation will soon be understood if you use keys regularly, and an experienced entomologist will know more or less instinctively when a couplet needs to be treated with care. We refer above to Joy's keys with good reason; there are a large munber of keys available that cover various groups of British beetles but the only book covering the whole fauna that is at all likely to be avaiable is N.H.Joy's Practical Handbook. Here we use 'whole fauna' in a relative sense, but more of this later. Over the last hundred years or so there are very many references in the literature to another work, namely Fowler's Coleoptera of the British Isles. This is a large, multi-volume work with many admirable colour plates depicting hundreds of species of all groups. When a copy becomes available it is likely to be very expensive and, while it must be realised that it will hold its value, one should consider the wisdom of obtaining this as a working tool. One of our members has a copy and would be pleased to give individual advice on its use, contact us. We have found some parts more useful than others. Joy's Handbook occasionally becomes available and these are sometimes affordable, although it must be said that second hand works on entomology in general seem to increase in price ever quicker these days. For a taster it can be obtained through the public library service. People seem either to love it or hate it, as one of our members says,'some parts are less useless than others' but this kind of thing is unfair, it remains a comprehensive work in the sense that almost every specimen can be assigned at least to the correct family and usually to an individual taxon, whether it is the correct taxon is another matter, and you will sometimes need to apply some imagination, and you will undoubtedly find mistakes and contradictions but even so all the large and difficult groups are covered eg. Philonthus, Aphodius, Bembidion etc. with varying degrees of success and the keys are, sometimes elegantly, simple. It is a book that soon becomes familiar and with a little perseverence very useful or even indespensible. If you can obtain a copy of Joy's book it will form the basis of your diagnostic work until you become familiar with the various groups and understand which of these are covered in other works. Using Joy's keys may or may not produce an accurately named specimen and there are several reasons for this. Many species have been added to the British list since the publication of Joy's work. Some species on the list in Joy's time have subsequently been found to have been invalid. Some species listed in Joy have been found to comprise more than one species ie. they have been 'split'. Some keys in Joy's work simply do not work but this may not be as problematic as it would seem. Some of the keys only work if reference material is available. Sometimes it is tempting to assign a specimen because it goes through the keys so well and because it agrees well with the small amount of description given. Sometimes an authorship is wrong. Some species were not included in Joy's work because he considered them too rare or extinct and so unlikely to be encountered. Sometimes (quite often) species from Joy's work have been included in families or groups purely for convenience, when using this work in conjunction with others this can cause confusion, especially for the beginner. All of the above would seem to present serious problems and perhaps foster the idea that there must be easier ways to get to grips with the British list, but over the years many coleopterists have worked towards making sense of Joy's work eg. many descriptions of species added to our list since Joy's time are accompanied with advice as to where they will key in his handbook. Before discussing these points it should be mentioned that there are a couple of other keys to the families of British coleoptera. Crowson's R.E.S. handbook may work very well, it ought to given the amount of detail it shows, but I have rarely had the patience to follow the keys through so I cannot really assess its usefulness, it is a daunting work and given the easier option of Joy there would need to be a very good reason to tackle it. Having said that it does constitute an excellent guide to the adult morphology of the various groups. For those interested in such things this work is greatly expanded in his larger work 'The natural classification of the families of the coleoptera',again this contains some daunting keys but is full of beautifully explained morphological descriptions and drawings of the various groups. Unwin's key is the opposite, simply laid out and constructed and with many good, if basic, line drawings. Most of the specimens I've tried to assign through this work have been O.K. but a prior familiarity is a great asset as without any descriptive text beyond the key couplets many specimens seen precariously placed. A strength of the work is its thorough cross referencing with Joy's handbook. There are many strengths in these two books; Unwin's work is basic but forms a coherent whole, Crowson's work also contains some good quality and useful habitus drawings.With these works and as many colour guides and publications as you can obtain the British family list soon becomes familiar. That is oversimplifying things quite a bit as there are formidable problems within the list but by and large as you try to identify a few specimens this familiarity is soon gained. To get the British list into some sort of perspective you will need to consult the Coleopterist website check- list, at first a seemingly endless list of latin in a range of fonts that obviously have some meaning but quite what this is seems beyond immediate explanation. But once the heirarchical nature is understood and after a few species have been successfully found it becomes gradually familiar, and soon it becomes absolutely essential. And it is not too much of an exageration to say that, without this list, the majority of species cannot be identified at all. We will refer freely to this list below in the hope that in doing so a feel for it may be gained. Coupled with what we must accept as the state of knowledge regarding classification and nomenclature, the list also contains many useful references, these are all the more useful as many individual species of an interesting nature for one reason or another are superscripted numerically to papers eg. introducing them to our list. A list of deletions from our fauna, with the reasons why, is given in the introdution to staphylinidae. All excellent stuff. One more publication must be mentioned before discussing the problems associated with Joy's work and this is NEW BRITISH BEETLES by Peter Hodge and Richard Jones, subtitled 'Species not in Joy's practical handbook'. Published in 1995 this book is somewhat out of date, more particularly so as the rate at which the checklist changes seems to have accellerated somewhat over recent years, but its usefulness should not be underestimated; in many way it is fair to describe it as essential for a coleopterist working with a wide range of material. At first glance this book seems to be a list of references and, as such, it is superb, but it is much more than this. Many of these new species can be placed to their correct couplet in Joy, and in some cases the additions can be indentfied using this book alone. In view of the somewhat haphazard (an unfair term, but at least partly justified) way our coleoptera has been reported on in the past ie. in a wide range of journals the collection of which involves great expense and the searching of which involves great effort, the timing of publication of Hodge and Jones book was greatly fortuitous for the British coleopterist. With the publication of the Coleopterist magazine we have seen the great majority of useful articles on British beetles drawn together in one place only a couple of years after New British Beetles appeared. The general result of this being that new species appearing prior to 1995 can be sourced through Hodge and Jones, the rest either appearing in the Coleopterist or referenced from the checklist. Of course the coleopterist will still be involved in much work obtaining these references but at least a huge and comprehensive source is readily available with only two works, and one of these is on line and updated. An updated version of New British Beetles is expected. 1(6) Th. nearly as long as el. 6(1)Th much shorter than el. This would seem straightforward enough until you have a specimen before you. Measuring the relevant lengths in our only specimen of Anommatus duodecimstriatus gives the thorax as 25 units and the elytra as 50 units. One needs to be broad- minded here. Under the specific description Joy states 'of very nearly the same shape as Aglenus; L.1.3-1.8mm' A line drawing of Aglenus is given and this is helpful. Previously, under the generic description he gives 'with rows of strong punctures on th. and el. ; ant with an apparently 1-jointed club.' Again this is helpful as Joy's intention is to be brief. But when you examine the beetle carefully a striking feature of its morphology becomes obvious very quickly. In vol 7 of Freude et.al. Vogt introduces Anommatus with a lengthy description of the genus and an important part of this lies in his very first word,'Blind, klein, cylindrisch....', ie. blind, small, cylindrical.... Had Joy mentioned the word 'blind' he would have given more confidence than that provided by the ratios when it comes to identifying this tiny, eyeless insect. With Joy take nothing for granted. Obtaining the reference given in both the checklist and Hodge and Jones will provided more information on this interesting genus. An example of a genus added to our list since Joy's handbook is provided by Uloma. This is a member of the Tenebrionidae, which is also covered by a 1974 R.E.S. handbook by M.J.D. Brendell, but unfortunately this also does not include the species. In both works the beetle will key comfortably to Alphitobius but the size alone is sufficient to show that it is not this species. Looking through the checklist shows several new tenebrionids since Joy's time so is not much use, and unfortunately this is a family not referenced in the list so again nothing to go on. Hodge and Jones describe a beetle fitting the description exactly but unfortunately the only descriptive reference given is in German. This seems to be a dead end and not surprisingly so as the species was thought for a while as possibly extinct. When we found it in Watford we suspected Uloma and on the strength of this our County recorder (Trevor James) kindly examined the specimen and confirmed our idenification, along with this he provided a reference detailing the history of its occurence in Britain and details of how to identify it. In this case our options were either to obtain the German work or to go with the description in Hodge and Jones and on the strength of this ask advice. In general, given a degree of experience, most things can be identified. If you have the 'German works' (see below) among your library and the patience and confidence to put aside difficult specimens for later examination, you will generally get them sorted out. But, as the following example demonstrates, not always. Among some specimens extracted from decaying wood we obtained a weevil which at the time was vaguely familiar. The collector tried to identify it but, having no particular interest in the group beyond obtaining records, failed miserably and then passed it round for others to have a go. It went so far in all the keys and then stopped, resembling nothing on our list. All the usual methods were then resorted to eg. Hodge and Jones and Fowler and as many guides as we had access to but still nothing. In this case the beetle was so obviously different that we sent it for specialist examination. It was found to be an Australian species only recorded once before in Europe, Achopera alternata Lea, and our discovery of it in the wild was obviously very interesting. In this case, in a sense, we failed. We were very fortunate in two ways with this species; firstly it was so very obviously different from anything else on our list, and secondly we had somebody willing to help. This combination of circumstances was fortuitous, now we keep all unidentified material in the hope of gaining experience which will allow us to find other unusual species. Things get more complicated with larger genera and here a certain degree of work is needed. The first step is to list the species in Joy and find these in the checklist so that 'missing' species can be highlighted. This is not a straightforward process and without great care things can be overlooked; there may not be a neat correspondence between Joy's genera, or any other grouping, and the checklist. The genus Philonthus will provide a few examples of this kind of thing. The first thing to notice in the checklist under the subtribe PHILONTHINA, which is the obvious place to look for these species, is that two other genera have in the past been included in Philonthus; Bisnius and Rabigus. Our search should obviously include these as well as a glance through the other genera. The following list is extracted from Joy's key and where a straightforward correspondence with the checklist exists this is indicated by a simple Ok. To make this exercise more meaningful the relevant checklist page should be viewed. laminatus Cr. OK (?) The checklist gives laminatus (Creutzer,1799), Joy sometimes quotes the wrong author but this should not be taken for granted. Other examples , where we have investigated are given later. intermedius Bond (?) Is this intermedius (Lacordaire,1835) ? marginatus Str. (?) Is this marginatus (Muller,O.F.,1764) ? chalceus Steph. (proximus Kr.) Is this succicola Thomson,C.G.,1860 ie. chalceus sensu Ganglbauer,1895 non Stephens,1832? The benefit of compiling this list will be obvious now as you will see that there are a few species on the checklist unaccounted for; two species of Bisnius and seven species of Philonthus. As an example of how to deal with these additions since Joy we will consider P.confinis Strand,A 1941. This is superscripted in the checklist to the following information,'Only known in the British Isles from 1 specimen found in Buckinghamshire in 1902 (Hyman,1994)' This is useful. Turning to Hodge and Jones we find the Hyman reference but also a brief description and reference to a paper by A.A. Allen. (1971 Ent.Mon.Mag. (1970)106:157-161, description and figures.) Very obviously we will need to obtain this(among others) in order to deal with the British list. Things here are not quite so crucial as they might be as Hodge and Jones state, 'Resembles P.varians(Paykull)...' so we might from Joys key feel safe in identifying species differing from varians, on the other hand there may already be some ambiguity with the identity of varians in Joy's key, see the above list. In cases like this it is essential to obtain the reference. 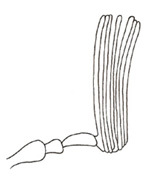 Allen's paper gives a description as well as some explanation concerning the identity of P.confinis A. Strand,1941, he also gives line drawings of the aedeagus and elytron markings. In this case the paper is more useful yet because he also describes P.micantoides Benick & Lohse,1956 and P. coprophilus Jarrige,1949, both additions since Joy and both today considered valid species. In order to deal with the British Philonthus species all additions since Joy will need to be referenced and descriptions obtained. This brief discussion is meant only to give a taste of how to proceed with identification, there are many keys available and these can vary in usefulness, having the literature as well as the experience to use it does not necessarily mean that good identificatios will follow, again we must stress that some specimens must be put aside until more material or literature is available. The second point made above,ie. species found to be invalid since Joy's Handbook, can be demonstrated by the Heteromeran genus Euglenes (Hylophilus in Joy.) The species we know as E.oculatus (Pk.) is called H.pygmaeus DeG. in Joy even though the confusion between these two closely similar species was understood and reported on by G.C.Champion as long ago as 1890 (Ent. Mon. Mag.,26:294). See Allen, A.A. 1969 Ent.Mon. Mag.,105:163-164, for a discussion of this case. The need for care when compiling local lists is obvious here but the benefit of researching nomenclature will be felt more especially when you use older lists; it is easy to get excited about seeing older lists of novel species from your local area but not quite so good when they begin to disappear through synonymy and misidentification. and both species are recognised as British. Joy was very ambitious in trying to cover the whole of our fauna but, with the best will, the subject was simply not understood well enough to be able to do this, not by Joy nor anybody else for that matter. Any addition to our list since Joy's time will invalidate his keys in the sense that they must omit these additions and this rather obvious statement is fair enough because as we have seen there are ways around this, but there is a more serious problem in that Joy's keys may cover all, or most, of our species but simply not work, or not work well enough. Cryptophagidae provide an example, aleocharine staphs provide another and more of these later. A much simpler example is provided by Anacaena; Joy begins his key with the very subjective 'more convex/less convex and 3-3.5/2.2-3mm' which may work well if you have reference material or are working with a mixed sample, but this may not provide the level of confidence needed if you have limited material and are looking for specimens for your reference collection. More recent keys (e.g.Friday,1988 or Hansen,1987) use the extent of the pubescence underneath the hind femora, and this character will work unambiguously for any specimen in any stage of development. This sort of thing is important to understand because sometimes a specimen will key through Joy but, because so many subjective characters have been used, will leave the identifier with no sense of confidence at all, here the knowledge that there might be other keys to the group will provide areas for research rather than being left uncertain. This is not to say that all groups have been covered since Joy, they have not and so Joy's handbook remains useful, nor are the replacements necessarliy the last word because research continues. Although this discussion has centered around Joy's handbook it must be realised that all keys are subject to the same sort of dating process and due care should be exercised e.g. some of the earlier R.E.S. handbooks are now very much out of date. A species is described under a specific name and, where possible, assigned to a genus if such is available that will encompass the characteristics of the species in question, if not a new genus, or higher group, must be erected. When described the species will forever more carry the name of the describer, if the species is later found to have been decsribed previously then the earlier name and author will remain the accepted name for the species and some synonymy will have been created, as with Quedius fuliginosus above. Things also get described through missidentification and this adds further to the pile of redundant names in our checklist but we must always be aware of these because at various times they will be referred to in the literature. This is all very frustrating when all we want to do is compile sensible lists of local species, it is just as much so when we interpret older lists to see how our fauna might be changing. But the outcome of all this is, or should be, a checklist on which we can rely for names to assign to our various finds. After some experience our eyes get used to reading a specific name as three words i.e. generic, specific and author and we immediately spot any inconsistency. And when reading Joy we soon get used to these, e.g. two Ciids are quoted in Joy as Cis nitidus Hbst. and C.festivus Gyll., these are quoted in their currently accepted form in the Coleopterist checklist as C.nitidus (Fabricius, 1792) and C.festivus (Panzer,1793). In this case there is no obvious way of checking authorship and, so it follows, correct identification. This case prompted a letter from the present author requesting help and, in this case, the matter was cleared up and a few references were kindly provided allowing us to follow up the situation. We now understand that the correct authorships for these beetles are as given in the checklist and are in no doubt about what species Joy was referring to. Other cases may not be so straightforward so a careful eye must be maintained when cross referencing names. We have said a fair amount about Joy's work because it remains so useful to anybody working with British coleoptera, in the course of using this book many other books and papers will be obtained and found to be more useful for many reasons but it is ultimately true to say that not all of our fauna is dealt with in the English literature and that, sooner or later, a choice will have to be made between using at least some foreign, generally European, works or accepting that we must ignore certain groups. Some foreign works are mentioned in our library and in studying any group it will not be long before you come across references for many others. This is a vast subject and we could hardly hope to do any justice to it through a general discussion so we will make the general statement that the various volumes by Freude,H.,Harde,K.W.,& Lohse,G.A. will be found useful and now go on to examine a very taxing group of beetles when it comes to identification and show how some foreign works may be used to great advantage. The aleocharine staphs are a difficult group in every sense of the word. When starting out it really does seem impossible that you will ever get to grips with the group, and a glance through Hodge and Jones will further assure you that with so many additions since Joy's keys, which in any case make no sense whatever except for a few very distinct forms, you stand very little chance of ever getting anywhere. Here it must first be said that the following discussion will only be meaningful to those who really and truly want to identify these things because to spend ones free time doing so must surely bring into question whether one gets out enough. But anyway, our starting point is Joy's handbook. On page 15 he presents a key to his various tribes based mostly on tarsal formula and on seeing this some degree of confidence is gained because one is tempted to wonder how difficult it can be to count tarsal segments. Coupled with this a glance through the relevant section in the plates volume reveals lots of very distinctive aleocharine forms so one begins to feel good. At some later stage, in order to preserve your sanity, you will give up trying to count tarsal segments; I have used high magnification, mounted specimens on glass slides, boiled dissected tarsi in KOH, mounted specimens on pins and rotated them under all sorts of light, stained and slide mounted them and done everything short of of using SEM to count tarsal segments and found no method that will work easily and reliably. This is overstating the case as, for some reason, the aleocharini seem to be easily dealt with but this group is not the source of the frustration. It is the 4,5,5,(Myrmedoniini) and 4,4,5,(Bolitocharini) that cause most of the trouble. So, forgetting tarsal formulae in all but the most simple cases, we move on to Joy's second key to the aleocharinae (P.16) which dodges these. And after trying to use this key, or rather set of keys, we start to think about tarsal formulae again. At this point we either give up or press on because here it really does seem as though we are getting nowhere. And actually, we are getting nowhere. Now it is a good time to realise that there are lots of other non staphylinid specimens to look at and that there will be no harm having another go later. In all probability very much later indeed. The immediate problems associated with using Joy's aleocharinae keys are these: The specimens are generally small and, because of the way Joy drew his line drawings, the smaller the specimen the smaller the drawing. A stag beetle is very large so gets a large drawing, these staphs are small and so get an apparently uselessly small one. Lots of the seemingly endless key couplets are highly comparative and when starting out you will have little or no reference material. Lots of these things look the same and Joy does not hesitate to make this obvious. But the most serious problem of all when using these keys is the lack of any confidence they convey that you are on the right track. At this point, without help, it is tempting to wonder whether these things are 'for real.' To progress with the group you now need to do the following: Take Joy's key and -no, don't throw it in the bin- try very seriously to key a couple of specimens you think are different, take each couplet at face value, explore both sides of a couplet if necessary and keep going until you reach a species or, more likely, a group of species. Label them and store them and accept that this is as far as you can go with Joy. These keys are complicated and sometimes seem ludicrous but treat them seriously, Joy intended them to work and in a great many instances they do work, Joy may have been a great optimist but he seems not to have been a fool; he had the kind of expertise discussed above but perhaps not the wherewithall to impart it to others. Anyway, we now have a few named specimens which, through lack of confidence, we can do nothing with. Now the European works come into there own. In 1970 Thure Palm produced the first volume of his treatment of the Aleocharine staphylinidae, covering amongst others those species variously included in the genus Atheta. Another volume appeared in 1972 covering Oxypoda and Aleochara. Further volumes cover the other subfamilies and groups. They are written in Swedish, and a glance at this would suggest that they make even less sense than Joy. The same goes for Freude et.al. which are written in German. But even without understanding the language nothing could be further from the truth. This species keyed to the genus Oxypoda in Joy because it is so Oxypoda-like in form, looking for the corresponding species in Palm or Freude will throw you off the scent because of the way the species has been dealt with by Joy in the past, only taking the opportunity to search through Palm's plates and cross referencing through Freude made any sense of the situation. This sounds a hit and miss way of doing things but it worked and, much more than this, demonstrated that Joy's key may not be quite so terrible after all. Since then we have used these foreign works to prove more than a few identifications from Joy's key to be correct. In truth Joy's key usually gets us down to a small group of species,our specimen can then be dissected for possible confirmation using e.g. Palm. A recent identification confirmed from the foreign literature was Atheta castanoptera (Mannerheim,1830), in Joy this keyed to Metaxya key 4 group including intermedia Th., aquatica Th., castanoptera (Mann) and pertyi Heer. Beyond this we could not sensibly go but the first spermatheca compared with Palm's figures gave us the species beyond doubt, the corresponding figure in Freude gave further confirmation. The sample from which the A.castanoptera came contained about thirty specimens, some were obviously different and were put aside for future work, about half were obviously castanoptera, morphologically very close in every way and so grouped together for mounting but an obstinent attitude forced us to dissect more of these 'obvious castanoptera' with the result that we not only learned how very distinctive the aedeagus is but also, as a result of this, that some of the specimens were not castanoptera at all. Work continues! These works open up a whole new world of possibilities for the British coleopterist, in the past each new volume of Freude was followed by reports in the journals of new species to Britain, it was suddenly straightforward for the amateur to not only confirm their identities but also to look out for new species. And all the groups are dealt with e.g. the easiest way to confirm some of the Philonthus species not included in Joy is to dissect them and compare the results with the figures in Freude. See also Autalia Id Aids. These foreign works are not all about using dissected material,the volumes of Freude contain countless very useful line drawings of all the groups found in Britain and in many cases can be used alongside Joys work. The works by Hurka mentioned in the library section contain excellent colour plates and keys in English. The Fennoscandian works cover most of our water beetles and are written in English. To get to grips with any particular group it is essential to realise that works must be obtained that cover all the species mentioned in our checklist, be these foreign works or otherwise, and that when identifying a specimen you must be aware of all the forms included in its genus or family so that nothing is missed. Ultimately you will always come across specimens that cannot be place with certainty and here there are often people working with the groups that will be pleased to give an opinion. To deal with e.g. aleocharine staphs it should now be obvious that as well as the shear hard work involved in identifying them using a microscope there will be another great effort required in obtaining and arranging referencs so that an awareness of the whole group can be acquired. Beyond the rather general advice we have been able to give we intend to explore the identification of particular groups in the pages dealing with families and species, the very brief mention above of the use of genetalia as an aid to identification will be expanded on elsewhere in the site as this is a very important aspect that was only just realised when Joy's work was published. We have given no advice on how to use a key and this was intentional; when I sat my twelve year old son down with with a specimen of Anaglypta and Duffy's R.E.S. Handbook the process of using the key seemed, after some trial and error, to come natural and we assume it will do so for others, we may be wrong but the use of keys by the scientifically minded seems to be an intuitive thing. Before ending this necessarily brief discussion on indentification there are another set of publications that we need to be aware of, namely the atlasses available for various groups and the volumes of Hyman and Parsons. These publications do the same thing, as does the National Biodiversity Network website, which is to give us an idea of the geograpical occurence of species included although some give other information as well, see Dr. M.Cox's excellent work on the Chrysomelidae. It must be realised that these works present data from recording schemes, sometimes this is partitioned in time e.g. pre and post 1970 records and this may give an idea of the way a distribution is changing, or it may not. Use these in context; this data is all they give and as such they will suggest which species may be expected from your area, but that is all. When identifying beetles it is very tempting to consult an atlas in order to asses the likelihood of a particular species occuring in your area and then letting this influence your final decision and this is natural enough but you must resist this kind of thing at all costs. Obviously if you are trying to assign a name to a specimen from Watford and your choices consist of two species, one common and widespread and one found only in the Scottish highlands, then you will be infuenced. In this case the distributions should suggest the use of great care in identification but that is all. The distribution of Acrotona sylvicola (Kraatz,1856) is given on the NBN site and not so long ago we consulted this in order to try to eliminate a 'highland' species from a local identification. This is a highland species and there is also a record from the Scottish border region and this is useful, on the basis of this the species is absent from that part of the mainland that would interest a Watford coleopterist, but most annoyingly there is also a record from the southernmost part of the Isle of Wight. This suggests that somebody down there knew what they were looking at, it also suggests that somebody in Watford should do likewise and not be influenced too much by the atlas. See also Psylliodes luteola (Muller,O.F.,1776) Obviously our intention is not to denegrate these excellent works which are valuable and intensely interesting for other reasons, we simply want to make the point that caution must be exercised in using them as an aid to identification. Finally a word about the descriptions we provide on our species pages. These descriptions have been provided to enable others to identify some of our local species, all have been written from specimens rather than simply repeating from the literature, and in some cases rather more detail has been provided than is absolutely necessary, this might be because we wish to draw attention to what we think are interesting features or it may be because we simply enjoy writing about these things but in all cases these descriptions are carefully considered; we have obtained as many keys as we can to the various species and, working back through them, listed the diagnostic characters back to the family or superfamily or whatever group renders the species distinct e.g. a weevil or a staph. In isolation these descriptions will be of very little use, combined with the photographs and the knowledge that the species are of local occurrence makes them more useful. The modern habit of providing descriptions of individual species after a key, e.g. Luff's R.E.S. handbook, shows how helpful such descriptions can be after a specimen has been keyed out; listing the relevant characters along with a list of similar species and advice is a much easier way to isolate a specimen when compared with going back through a key, or set of keys, to unearth them. We believe our descriptions may provide a similar function for those working with keys to all sorts of groups. In the future we want to feature keys that make use of the site's ability to link between pages and a key in the ID aids section. But this is for the future.